Is There a Sleeper Cell in Your Cat’s Tooth? Is there danger lurking in your cat’s mouth? You might be surprised to hear that more than half of all cats older than three years old have at least one tooth that’s in the process of resorption. Right under your cat’s nose, that innocent looking face may be the carrier of…a sleeper cell! What is Feline Tooth Resorption? When you have a baby tooth, there are cells that go in and break down the root of the tooth, so that it becomes loose and eventually falls out. For the insanely curious, these cells are called odontoclasts. Ordinarily, these cells do their job on the baby teeth, and then they go to sleep forever. For some reason – and noone knows why – sometimes, these cells wake back up and begin attacking adult teeth. Instead of the tooth falling out, lesions appear along the gum and start to erode the tooth away. This is known as tooth resorption. It happens with humans, it happens with dogs, but most often, it happens in cats. In early stages, resorption is seen outside a tooth where it meets the gum. The only evidence that’s detected may be a small defect on the enamel. In the last stages of resorption, the tooth has eroded so far that it’s little more than a slight bump covered by the gum. What are signs to look for? What should you do if you suspect resorption? You cat’s best advocate is you. Should you suspect mouth problems in your cat, bring her in for a thorough check-up. Lower jaw teeth are the most common ones affected, but any tooth can be vulnerable. The best way to assess his mouth is with intraoral x-rays, and the subsequent diagnosis determines the therapy approach for your cat. Typical treatments involve partial or complete tooth and root extraction. While experts can’t pinpoint the exact cause for feline tooth resorption, they concur that the malady can be extremely painful for your pet. If you suspect your cat is affected, bring him in for an examination. Of course, during a routine well cat exam, we always take a look at the teeth for any signs of trouble, too, and if we see any problems, we’ll let you know – before it develops further. Our goal is to keep pet healthy and happy – from teeth to tail. You can count on us to be on the alert for any sleeper cells lurking in your cat’s mouth. Town N Country Animal Hospital…fighting tooth resorption – one kitty at a time! *Feline Tooth Resorption is also known as cavities, neck lesions, external or internal root resorptions, feline odontoclastic resorption lesions (FORL’s), and cervical line erosions. Fleas aren’t just for outdoor cats. Fleas can also instigate a plethora of problems when they get a free ride into your house. As you mow or do yard work, a small flea can latch onto your clothing and hop onto your indoor cat. So even if your cat never ventures into your yard, he still needs preventive treatments to be protected. If your cat’s allergic to fleas, you may notice a slight dermatitis, but many cats don’t show any physical symptoms at all. Before you know it, you could have a flea infestation in your carpet, furniture and furnishings. Timely prevention could save your cat’s life. Did you know that cats can get roundworms from ingesting the common house fly? And all it takes for your cat to contract heartworms is a bite from an infected mosquito? A necropsy performed on a young indoor cat at Town N Country recently revealed heartworms. His untimely death shocked and saddened his family. Your cat needs routine deworming, heartworm and flea prevention. 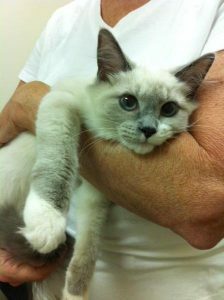 Unfortunately there’s no known treatment should your cat contract heartworms, so prevention’s key. We can help you treat your cat with the proper dosage and keep her safe from parasites. What’s a pet owner to do? The recommended treatment, Revolution, prevents most intestinal parasites, ear mites, fleas and ticks. Once a month, Revolution is usually applied between your cat’s shoulder blades. It’s simple, effective and the most economical approach. Collars and other treatments that you can purchase at retail outlets may be too strong or completely ineffective for your pet. Your cat’s best preventive treatment is only a phone call away. Give us a call and let’s set up a time to see your pet and talk about what’s right for your cat. Does your kitty consider the trees, bushes and occasional bird house in your back yard an all-she-can-eat buffet? Does your tom cat stalk the squirrels in the front garden or an occasional mouse in the house? Cats crave meat, and they will instinctively hunt for prey. Raw meat is what their ancestors ate and what most cats need today to function best. Good nutrition and its benefits. A tried and true raw diet can markedly improve your pet’s overall health and immune system. Benefits of optimal nutrition include a lush, glossy coat, healthy skin, lean muscle tone, a robust immune system, strong bones and teeth, healthy heart, and increased energy and vitality. The idea of feeding your pet raw meat may sound a little strange to you, and you may wonder how to start or what’s practical. We can help! 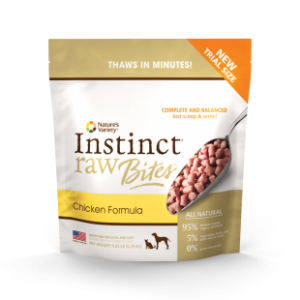 At Town N Country, we recommend and sell Nature’s Variety Instinct Raw Frozen Diets. And you might want to start small and see how your pet responds. Starting a “raw” diet isn’t an all or nothing proposition. We’d be happy to discuss your pet’s nutritional needs with you. Don’t make your cat wait for a mouse to wander through! Come by and meet the meats we have to offer! NOTE: This month (August, 2013) you can get a free sample of Instinct Raw’s Bites! Just come in and say “Raaaaaaaaaaw!” Find out more here. Nature’s Variety Instinct Raw Frozen Diets are the first and only raw diets to be scientifically substantiated as complete and balanced for all canine life stages through AAFCO Protocol Feeding Trials. Consider Natures’ Variety Instinct Raw Frozen Diets, the food that’s scientifically formulated with 95% meat, organs and raw ground bone, 5% fruits and vegetables. You won’t find any grains in Nature’s Variety Raw because you won’t find any wild cats munching on grains. It’s just not what nature intended. You also won’t find any synthetic or chemical fillers on their ingredient listing, just what’s simple and good for your cat. Come by and let your kitty try it out today! Get a RAAAAAAAAAAAW sample – free! Dogs and cats are instinctively meat eaters. Meat is what they crave. Think of the dead bird offering that your cat so proudly left next to your slippers last week. Nature’s Variety Instinct Raw Diets are very similar to what your pet’s ancestors ate and what your pet would eat if she returned to her natural habitat. If you’ve not tried them with your pet, now’s your chance! *Actually, if you’re shy, you can ask for your free sample in your best human voice. Summer months and warmer weather can present a challenging environment for your pet. Dogs aren’t nearly as adept at controlling their core temperatures as humans are. They can’t take off their fur coat, adjust the thermostat or roll the car windows down. Dangerous situations include leaving a pet in a back yard without shade or exercising a dog in direct sun. Exercising induced hyperthermia is the what we see most often at Town N Country. But nationwide, leaving a pet in a parked vehicle is the most common situation that can lead to heat stroke or hyperthermia. A study done by Stanford University* reveals that the temperature inside a parked vehicle can commonly spike 40 degrees within an hour. Cracked windows or even leaving the air conditioning running didn’t significantly alleviate the warmer ambient air. So this means that on a day when the temperature is a comfortable 70 degrees Fahrenheit outside, the temperature inside a car can be 110 degrees in an hour. Keep in mind that short-nose breeds like Pekingese, Pug and Boston Terrier can be particularly susceptible because their panting may not be sufficient to cool increased body temperatures. 2. Get your dog out of the environment where she became overheated. 3. Move your dog to a shaded, cooler place and direct a fan on her. 4. Cool your dog slowly. Place cool, wet towels on the back if his neck, in armpits and groin region. You could also wet her ear flaps and paws. Avoid the use of ice or cold water. 5. Keep drinking water available, but don’t force water into your pet’s mouth. 6. Stay with and observe your dog closely. 7. Once your dog’s cooled down and stable, take him to the vet. Heat stroke or hyperthermia affects nearly every system in the body. Your dog should be checked for any inconsistencies or potential problems. If you have any questions about heat stroke and your pet, give us a call. A bit of prevention remains your best approach to protect pets during hot summer months.